Marks and Spark's lemon shortbread biscuits have been a little indulgence of mine. They're quite homemade-looking with a light, crumbly texture and mild lemon (not zesty) flavour and are gluten-free. One box can be eaten in one sitting. This is a fact I have tried and tested. I will have to tackle Co-op's Free From berry bars and fruit and nut cookies together as they serve the same purpose: to fulfill my need for sweets. If you're anything like me, you go through phases of yearning for salty then sweet food. These are the ideal sweet craving fix. The berry bar is a cereal and fruit mix with big chunks of berry. Individually wrapped I like to have them on the go as well as on the go slow. The only thing is the lack of gluten seems to have made them crumbly so the 'bar' can easily end up in crumbs- usually on my top- just a tad embarrassing when in public! The fruit and nut combo - there's just something about fruit and nuts that make them the ideal combo. IRather than a crunchy texture these delectable biccies are quite soft, simple no-fuss sort of cookies. Unfortunately, I haven't found the Eat Natural bar range to be of the same calibre. Several times I have ended up picking them up when there hasn't been much natural, healthy or alternative on offer at the supermarket. 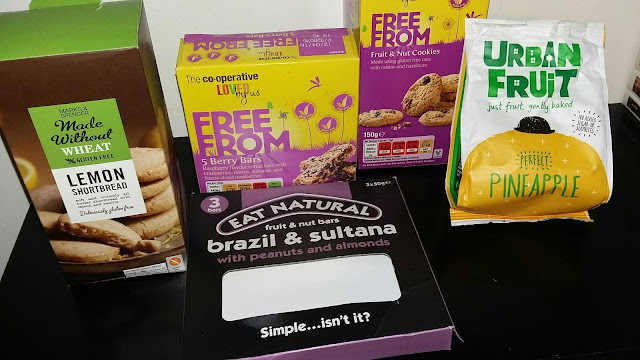 Despite the fancy packaging, and their use of natural ingredients, I have been left disappointed by the hard, dry, flavourless contents of several of the bars in the range, including the brazil and sultana and almond and apricot. On a good note, Urban Fruit has been a pleasant discovery for me. Their bag of dried pineapple rings goes a long way, which is saying something coming from a dried fruit junkie- if you hadn't realised already! Have you tried any of these or have any suggestions for healthy alternatives?